The statewide transit tax is calculated based on the employee's wages as defined in ORS 316.162. Employees who aren't subject to regular income tax withholding due to high exemptions, wages below the threshold for income tax withholding, or other factors are subject to statewide transit tax withholding. The definition of "wages" excludes amounts paid to certain types of employees and independent contractors (ORS 316.162). Self-employment income isn't subject to this tax. 1.1. 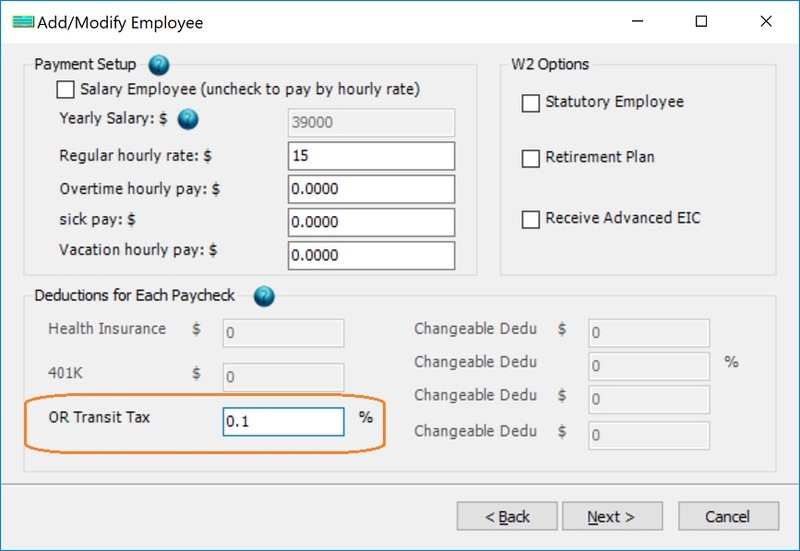 Start ezPaycheck, click the left menu “Company Settings->Deductions” to open the Company Deduction Setup screen. 1.2. 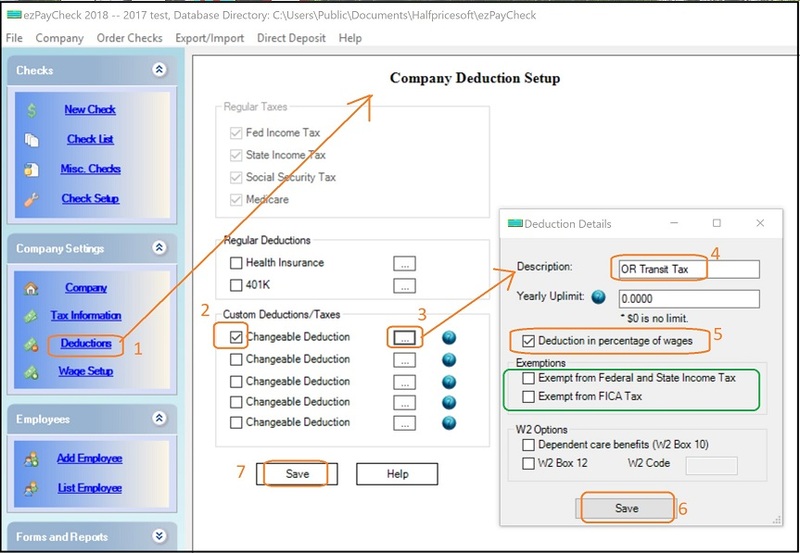 Check one Customized deduction item, then clicked the button behind it to open the Deduction Details screen. 1.3. Input the new name (ie: "OR Transit Tax"). 1.4. Check the "Deduction in percentage of wage" option box..
1.5. Leave exemption option boxes unchecked. 1.6. 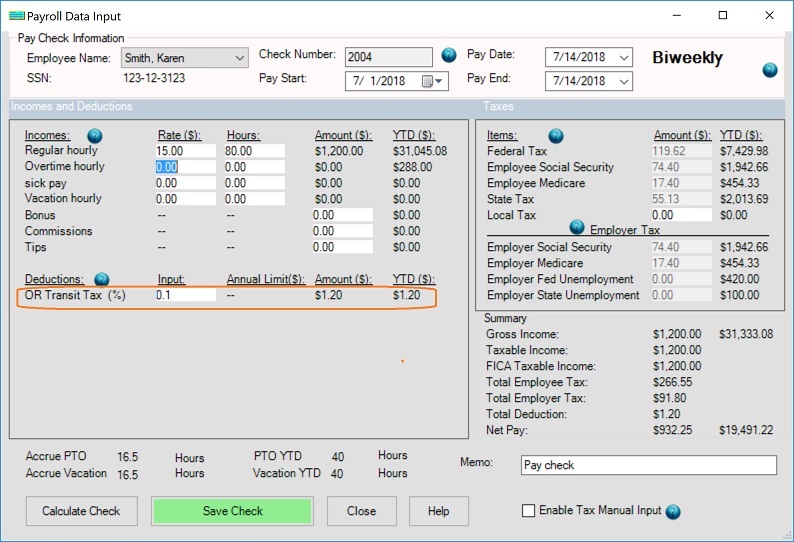 Click the "Save" button on Deduction Details screen. 1.7. Click the "Save" button on Company Deduction Setup screen to update the database. 2.1. Select one employee from employee list and edited his deduction option. 2.3. Click "next" button until the last page, then click the "Finish" button to save the change.